The Debenhams Beauty Club is a new loyalty scheme offering points-based discounts and freebies exclusively for it's members. Debenhams isn't a place I would usually visit for my beauty products, but after seeing a feature about this scheme in yesterday's You magazine (with the Sunday Mail) I decided it was worth a second look. 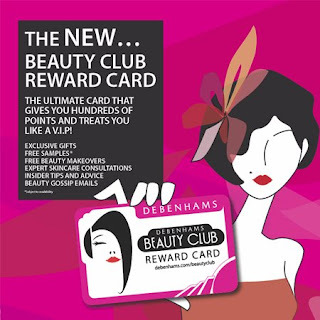 The Beauty Club offers points on your card whenever you make a purchase in-store in the Debenhams Beauty Department. These points can then be exchanged towards money off credits - in increments of £5 - against future purchases in the beauty department. At present, points can only be collected and redeemed in-store. Online purchases cannot collect points, nor can points be redeemed when shopping online. The Beauty Club also offers exclusive freebies for it's members and a regular email newsletter featuring the latest beauty news. For purchases up to £25, you will earn one point per £1 spend. For purchases over £25, a more generous three points per £1 spent are earned. Transactions can include more than one item in order to earn these points. For example, if you were to buy a Touche Eclat at £23, this would net you 23 points on your card. However, if purchasing a YSL Touche Eclat and a Mascara Volume (value £21) in a single transaction, totalling £44, this combined purchase would earn 132 points in total. Rewards are calculated on a monthly basis, in lots of 500 points. Each 500 points rewards you with a £5 discount against purchases, which can be redeemed as part payment. This means that you need to earn more than 500 points in any given month to qualify for a £5 discount. If you earn 1000 points, you would earn a £10 discount, and so on. Points can be carried over from month to month, and rewards are given in the month following that where enough points were accumulated. For example, if you earn 200 points in May and 300 points in June, your £5 reward will be credited in July. To earn enough points for each £5 credit, you'll likely have to spend at least £163 (in transactions over £25 each time). For many mums, it may take a long time to accumulate this many points, though Debenhams assure us that there will be frequent occasions where bonus points will be offered. I'm a sucker for freebies, and must admit that this aspect of the Beauty Club is what I'm most interested in. At present, Debenhams are offering quite a few freebies for Beauty Club members, some of which are "no-spend" offers (meaning we don't have to spend anything to get them - hooray!). £5 worth of points for a £25 spend on cosmetics or fragrance. The website states that this offer is limited to one transaction per customer, per day, so I'm not sure if we can acquire £5 of points each time we spend more than £25, or if this is a one-time offer. Anyway, this offer ends on the 14th of June so be sure to get your points if you plan to buy fragrance or cosmetics this next month! Free gift worth over £50 from Elizabeth Arden, with two or more purchases from EA (one to be skincare). I love the look of this gift set, which includes a full-size lipstick and summer make-up pallette. Other current offers include a minumim spend/purchases from their relevant departments. Take a look at the Beauty Club events page for more details. To become a member, you must visit a Debenhams branch to collect your free Beauty Club card. You can begin earning points straight away, but will need to register your card online for your rewards to be credited and to receive the regular beauty newsletter. You must remember to take your card each time you make a purchase, as points cannot be transferred after purchase. If you lose your card, points cannot be transferred to a new one. One good thing may be that friends and family can also help you build up points by borrowing your card when they make purchases too. In my opinion, the Debenhams Beauty Club is most rewarding for those who regularly purchase premium beauty brands, either for themselves or as gifts for family and friends. As much as I adore my Chanel lipsticks and fragrances, these are purchases I buy only on rare occasions (or receive as gifts), so to earn even a £5 voucher, it would take me literally years to clock up the points I'd need. The prospect of free gifts and consultations is somewhat enticing; however, in my experience we can receive these without having to join a loyalty scheme. Perhaps the Beauty Club will make these more accessible? Personally, I will not be ditching my Boots Advantage card in favour of the Beauty Club, since I can earn points on all my purchases from Boots and my points build up much more quickly. Have you joined the Debenhams Beauty Club (or are considering this)? What do you think of this scheme so far, and how do you think it could be improved? Please feel free to let us know by leaving your comments below. I like the fact that you can pay partly with your Debenhams points and part by cash or credit card, so you don't have to have enough to cover the cost of a whole product, with the boots card you have to have the full amount of points.